Designed by world-leading interior design experts with the modern holidaymaker in mind, the flagship Britannia is an experience like no other. Combining the excitement of cruising with the sophistication of a five-star hotel, Britannia isn’t just the biggest ship ever built exclusively for the British market – she’s the most glamorous too. Your first moments on board are sure to be truly memorable as the spectacular ‘starburst’ centrepiece of her atrium comes into view. She is perfect for families, giving you the opportunity to enjoy quality time and family-friendly activities such as trips to water parks, zoos, aquariums and city tours together. Not only that, she ticks all the boxes for adults too, with a relaxing range of options including plenty of restaurants, bars, pools, a luxurious spa, gym, theatre and shops to give your holiday special touches. 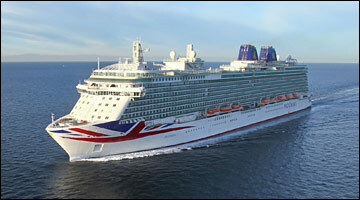 your experiences on Britannia are sure to be truly memorable!